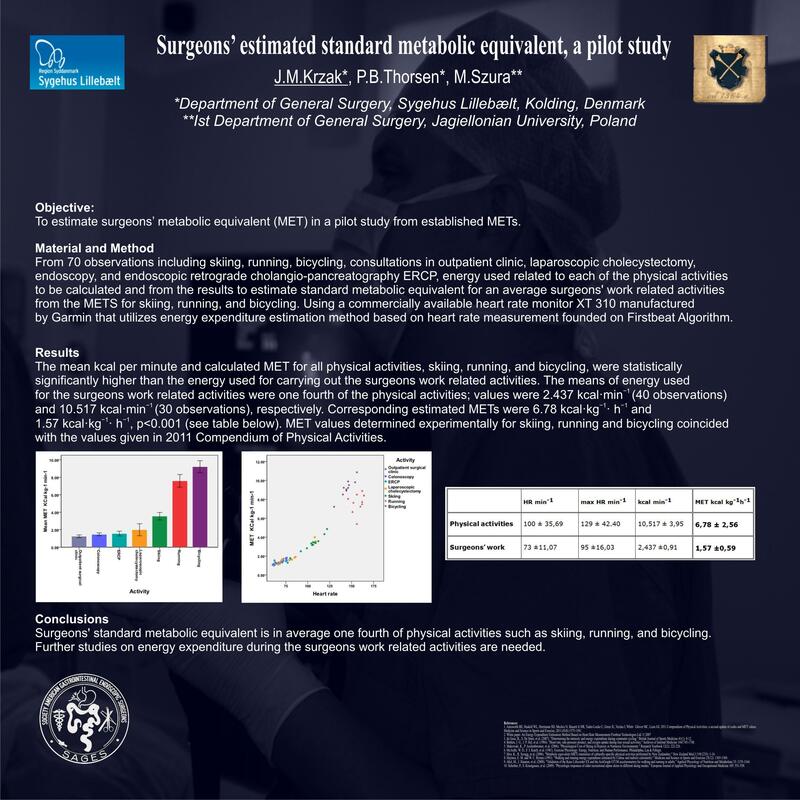 Surgeons’ Estimated Standard Metabolic Equivalent, a Pilot Study. To estimate surgeons’ estimated standard metabolic equivalent (MET) in a pilot study from established METs. From 70 observations including skiing, running, bicycling, consultations in outpatient clinic, cholecystectomy, endoscopy, and endoscopic retrograde cholangio-pancreatography, energy used related to each of the physical activities to be calculated and from the results to estimate standard metabolic equivalent for an average surgeons’ work related activities from the METS for skiing, running, and bicycling. A Garmin Forerunner XT310 was used for energy monitoring. The mean Kcal per minute for all physical activities, skiing, running, and bicycling, were statistically significantly higher than the energy used for carrying out the surgeons work related activities. The means of energy used for the surgeons work related activities were one fourth of the physical activities; values were 2.437 Kcal per minute (40 observations) and 10.517 Kcal per minute (30 observations), respectively. Estimated METs for a surgeons work can thus be calculated from METs agreed upon for skiing, running, and bicycling (2011 Compendium of Physical Activities). Surgeons’ standard metabolic equivalent is in average one fourth of physical activities such as skiing, running, and bicycling. Details of calculations will be presented.